If you haven’t already done so, it’s time to put up the Christmas tree, yippee! Although you can’t go wrong with baubles, tinsel and lights- I love having a sweet treat up there as well. Purple foil-wrapped Cadbury’s chocolates hanging from gold thread are a favourite in my household but this year I’m going to try making decorations out of gingerbread. I have some wonderful cookie cutters in the shapes of snowflakes and Christmas trees and I’ve been dying to try them out. I sometimes struggle making biscuits but these have worked out really well. I hope you like them too! 350 gr. Plain flour, plus extra for kneading and rolling out. a little water may be necessary. In a large bowl, mix together the flour, cinnamon, bicarbonate of soda and ginger. I like mixing with a knife. Add the butter and use your fingertips to mix until it looks like breadcrumbs. Stir the sugar into the mix. In another bowl, (I use a measuring jug), lightly beat the egg and syrup together. Use the knife to mix until fully incorporated. Next, knead the mix with your hands, adding extra flour where necessary, to bring to a smooth ball. Wrap the dough in Clingfilm and leave it in the fridge to chill for at least half an hour. Line a baking tray with baking or greaseproof paper. Roll the dough out to no more than half centimetre. Preferably slightly less but not too thin either. 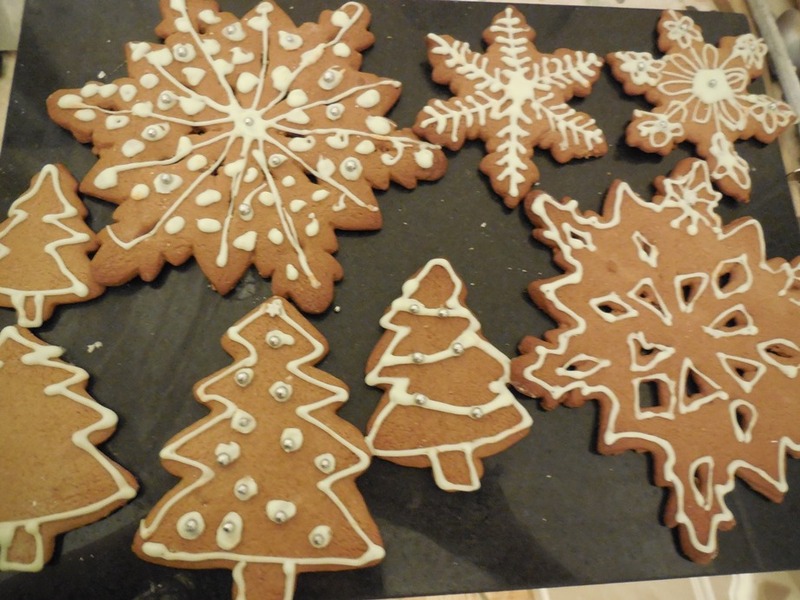 Using your cutter, preferably a lovely Christmas one, cut out the shapes. If you do intend to hang them on your Christmas tree, use a skewer to make a small hole at the top of each biscuit. Bake for 12-15 minutes, or until lightly golden brown. Leave on the tray for 10 minutes before transferring them to the cooling rack. To make the icing, add the icing sugar into the bowl, add the juice and zest and mix together until smooth but not runny. Put the icing sugar in a piping bag and decorate in a pattern of your choosing. I have added some edible silver balls to my biscuits- let your festive inner spirit guide you! The orange zest in the icing really adds a kick to the flavour of the gingerbread.